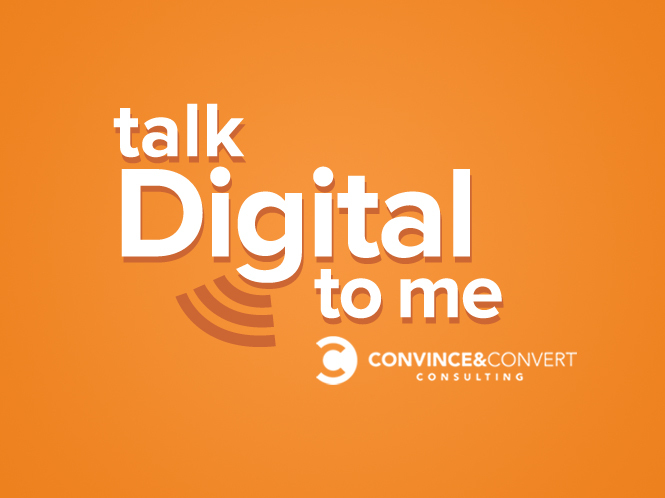 This is episode one of a brand-new series we’ve started here at Convince & Convert called Talk Digital to Me. We spend a LOT of time here working with big, amazing companies all over the world, helping them solve their customer experience, influencer marketing, content marketing, and social media challenges. But we don’t talk about what we’ve learned or what we know very much. Even here on our digital magazine, a lot of the content is created by our remarkable cast of guest contributors, not Convince & Convert experts. So, in each episode of Talk Digital to Me we’ll hear from a different member of our team, talking about what they do, and what they know. Talk Digital to Me is hosted by Kate Volman, who is a total pro and a great video interviewer. In this debut episode, I talk about what I’ve learned about marketing and business after working with hundreds of big companies since 1993. Please ask any questions in the comments below the transcript, and I’ll get back to you ASAP. Kate: Welcome, everyone, to the very first episode of Talk Digital to Me. So exciting. This is going to be a really fun project because the people over there at Convince & Convert, all the team is doing amazing work. Jay kind of leads it up. We all see him out and about and speaking and writing books and all over the place. But there are so many things that go on behind the scenes that you don’t know about and it’s all of these amazing team members. So every time we do one of these shows, I’m going to be interviewing one of the Convince & Convert team members and we’re going to be talking about a different strategy, a digital-marketing strategy to help you with your business. Of course, today’s first one is with the President and CEO, Jay Baer. Jay: Thanks so much for having me. Thanks for being a part of Talk Digital to Me. Yeah. So here’s what happens. I’ve had Convince & Convert now for eight years. People see me at conferences or whatever, in airports, and we start talking about the business and they can never believe how many people there are at Convince & Convert and how multi-faceted the company is and we’re doing all this consulting work for amazing brands like the United Nations and Adidas and SAP and Cisco and all these great brands. So we wanted to do a series that kind of showcases who those people are and really what they do. The company is a lot different than a lot of companies. It’s purely virtual. We have people all over the world. We have consultants living in the Dominican Republic and Costa Rica. So we operate a lot differently in a very modern kind of way. We have one company meeting a year. We get together once a year. We just do things really differently. People seem to be really interested in that. So we’re going to do this series and each episode we’re going to take a different person on our team, have Kate asks them questions about what they do, their area of expertise. You’ll learn a little bit about Convince & Convert, but you’ll also learn lessons about social media, about content marketing, about customer service, about digital, about influence marketing. The kind of work that we do at Convince & Convert Consulting and Convince & Convert Media. So, I couldn’t be more thrilled to be making this happen. Kate, thanks so much for leading the charge. Kate: Absolutely. I am super excited. In addition to all these great strategies, we’re going to get to know a little bit about what each of you do and your roles. So, as the President and CEO, what do you do? What are your days filled with? Jay: Well, it’s changed a lot over the years as the company has grown. We were on the Inc. 5000 list last year as one of the fastest growing small businesses in the U.S. It was just me for a little while. It’s certainly not anymore, as I mentioned. I spend a lot of my time actually speaking. I’ll probably end up doing 60-65 events this year and getting to those events and speaking at those events and preparing presentations for those events is a significant part of what I do. I also create a lot of media, so my own podcast, Social Pros, my other show, Marketing Marvels, where we demo really interesting marketing software and talk about that, plus the blogs that I write and a lot of other things and guesting on other people’s podcasts, etc. I would say my job is speaking, setting the strategic direction for the company, creating content and then approving and overseeing our consulting deliverables. I don’t do a lot of the consulting day to day or slide to slide if you will, at this point, but I do look at everything before it leaves the company and before it goes to clients. I want to make sure that we’re on point with all those recommendations. That’s how I do it. Then also a lot of joint ventures and partnerships. So when people say, “Jay, we’d like to work with you guys on a podcast. How would that work and what’s the deal?” So, I so a lot of that kind of deal cutting as well. Kate: You’ve been at this a long time. So, what do you think has been the biggest change that you’ve seen over the past five years the way that companies are approaching digital marketing? Jay: Since 1993, I got involved really, really early, kind of accidentally. I was working for the Department of Juvenile Corrections in Arizona. My job was essentially to give tours of the juvenile prison, which is awesome. So I quit my government job and started working at an internet company without ever having been online, which was an interesting first day at work, for sure. I have seen a lot of changes since then, for certain. But in the last five years, as it relates to social in particular, I think a couple of things. One, the shift from organic reach to paid reach is huge, right? It wasn’t that long ago that social media was mostly an organic reach game. You would create content, put it out there and your fans would find it. That clearly doesn’t work as well as it used to because of competition and because of the way algorithms have changed and continuing to change. Social is becoming much more like advertising than it used to be. That requires different personnel. It requires different strategies, different measurement schemas. Then I think the rise of content marketing, we’ve always had content. Content has been around forever as many people have written about and talked about. But now, you wouldn’t even think of having a business that’s strong online without a distinct and viable content marketing strategy and that has catapulted a lot of organizations, including ours, into the spotlight and I think it’s a terrific trend and it obviously works for a lot of businesses. But even that’s getting harder as well because of competition and you have to spend a lot of time now thinking about content amplification, not just content creation. Of course, that’s some of the work that we help people with too. Kate: You work, like you said, with some of the most interesting brands like Nike and Best Buy, Infusionsoft, really, really big brands. When you work with them, how do you help them approach digital marketing different than the average company out there? We are always thinking about how do we tie these things back to business outcomes. We are huge advocates, almost ridiculously so, about look, the goal of social is not to be good at social. The goal of social is to be good at business because of social. The same is true of content. So we’re constantly harping on how are you making money, saving money or both based on social, content, etc.? If you can’t articulate that, then you really don’t have a reason to do any of it. Ultimately, this is about business, not about likes. You can’t pay your mortgage with retweets. So we really spend a lot of time helping people think those things through. Then we also very much help organizations play the long game. It’s very easy to get caught up in, “What are you doing today and how many likes did you get on this one picture?” All the things that we do in digital today force us to think short-term. It’s very dangerous. It’s not a good way to run a marketing department. We’re constantly helping our clients think longer, longer horizons and determine how do we actually build our businesses using social and digital and content over quarters or years as opposed to trying to figure out what we’re doing the next 20 minutes. Kate: Right. Kind of building on that, when companies now are working on their digital strategies, there seems to be a real big disconnect between the departments, still, especially with like marketing and sales. So when you talk about putting together teams and how they all have to work together and build this longer term strategy, what should companies be doing now to bridge the gap between all departments so these efforts work well and everyone is on the same page? Jay: It’s funny. I just finished a blog post that I wrote for Workfront, which is one of our partners, great software company that helps businesses collaborate better internally, etc. The blog post is called “The Death of the Org Chart” and it’s all about how I believe we’re going to get to a point where marketers and marketing departments don’t actually have a job or a job title, that everybody will be a generalist. It does move quickly. The roles and the responsibilities are blurry and intersecting so much now, that the best marketing teams are very much cross-functional and you can just move people in and out on projects like Legos. So that’s what I think the future is. Kate: You know, I think for a lot of small businesses, even in a small business that’s really challenging. With these bigger brands that you work with, can you give an example of someone that you went in and you were able to help them kind of restructure their team in a different way to be more productive? Jay: We’re in the middle of a bunch of those projects right now. I can’t say any that have all the way figured it out because you have to do it over time. You can’t just like walk in and say, “Hey, you guys who have a specific job, you’re fired. All the generalists, you get to come.” It takes years to actually kind of reconstitute major enterprise marketing departments. We’re in the mix. Kate: What do you think is one of the biggest mistakes that businesses are making today with their digital marketing? Jay: I just touched on it earlier, impatience, just thinking that everything has to pay off in the next five minutes or the next week or the next month. If you’re looking at monthly reports and making decisions, real decisions based on monthly reports, you’re doing it wrong. The time horizon is too short. You can have all kinds of anomalies that will change your results over a 30-day period. You’ve got to start thinking about how does digital impact your business over time. That’s why you need to look at trend lines, not necessarily individual data points. That’s the biggest challenge, just being impatient. Kate: And for companies that are always having that conversation around budget, what kind of guidance would you give someone that’s trying to figure how much they should allocate in their budget towards digital? Jay: I don’t know that there’s a set number where you can say, “Invest 10%.” But what’s fascinating, I did a panel session at Oracle’s Modern Marketing Experience Conference in Las Vegas a couple of weeks ago and the subject of the panel was marketising, marketising, that marketing and advertising are converging and they very much are. One of the fulcrums for that conversation was the fact that in 2017, which is around the corner, there will be more dollars spent on digital than television for the first time ever. Jay: That’s crazy. Right? You’re like, “Oh boy, wow,” And you think about that and it’s remarkable. Like, “Wow, more than television.” But when you actually kind of break down the numbers, digital in terms of the time spent, the amount of time that people spend online and the amount of dollars spent is still under-advertised, especially mobile. Even though we have a lot of promotion, we have a lot of advertising, we have content, we have a lot of everything in digital, it’s still sort of under-optimized, in terms of messages and consumers. So we’re just scratching the surface. Kate: We can track better than ever before where we’re spending and what kind of results we’re getting. So, two things, what should people be tracking and measuring and then do you have great apps or tools that you recommend most of your clients use to help them do this? Jay: You’ve got to track in multiple levels. So when we think about content marketing, for example, we’ve got a very popular presentation on my SlideShare account called “The Four Main Types of Content Marketing Metrics.” You’ve got to measure consumption. So how many people actually consumed your content, your social object, etc.? Then you have some sort of behavior metric. That could be a like, could be a comment, could be a click, it’s some sort of activity metric. Then the third level is some sort of lead generation metric. So, did people who interacted with this piece of content, this social object, did they then take a subsequent action which indicates interest in whatever it is you want them to be interested in? But if somebody, for example, watches this show and clicks a link that will be embedded in this episode and then subsequently comes to our site and visits one of our consulting pages, consulting services pages, that’s a behavior that while not a trackable lead in that we’ve collected their information, clearly shows that they have an interest. So capturing hat behavior is really, really important. That’s the third level. Then the fourth level, of course, is actual sales. To say look, this person became a customer, gave us money, etc. as a result of this content or this social object. So you always have to build metrics around four layers. Consumption, activity, leads and sales. So, you create a metrics narrative that checks all of those boxes. And you know what? Here’s the dirty truth, Kate. Somebody says, “What’s the very best tool for measuring social media and content marketing?” Excel. That’s the truth. Pulling the numbers and actually analyze them instead of just trying to push a button and print out a report. Actually knowing the numbers and being able to study them, that’s the truth. Kate: When you meet with a new client or a prospect, can you kind of walk through the process that you go with them in determining what kind of digital strategy to put together for them? Jay: So, we have a process called STARS. It’s a methodology where for each of the four disciplines that we offer, social media, content marketing, customer service and influencer marketing and other folks on this series, Talk Digital to Me, will reference those four kind of areas of service that we have. Within each of those area, STARS stands for S is Speak. So, we’ll come in and do a keynote presentation. That’s the first thing we can do. T is Train. That’s when we do sort of a workshop, half-day, full-day workshop about social, for example, or content. A is Assess, where we’ll come in and really look at where a company is today and do a lot of, kind of, SWOT analysis. How are they doing in content marketing today? What are their competitors doing? How can get they get better over, say, a 90-day time horizon? R is Roadmap, which is sort of the assessment times the assessment, so the assessment plus. We do a much more deep dive analysis and we give them a 12-month roadmap for how to get better at social content, customer service, etc. Then S stands for Step-up projects, which is where we tackle a whole series of self-contained projects like, “Find us influencers,” or, “Build us a content marketing scoreboard,” or all those kinds of projects. We tackle those over the course of a few months. So, when we bring on a new customer, the first thing we do is a significant amount of brand anthropology, where we actually do a lot of research, a lot of looking under the hood, look at a lot of what they’re doing. We get access to all their reports, all their data, all their customer profile information. And then we have them complete a very, very detailed brand anthropology questionnaire, so we really understand what they’re trying to accomplish at the business level and where they’ve come. A lot of times people are like, “Yeah, we tried that once. At one point we did Google+ and now we don’t.” Or whatever, and you want to kind of have some of that history so you’re not recommending things they’ve already tried. Kate: Why do you do this every day? Jay: Well, two reasons. One, what I really am is a teacher. What I wanted to be doing at this point in my life was to be a college professor. Then I realized that actually that’s kind of what I do now, just for a really, really big classroom. So, the knowledge transfer part of it, the opportunity to help people, whether they’re marketers or business owners or executives, make their business better, I just have a deep passion for that. My mom was a high school teacher. My stepdad was a high school teacher. My aunt was a very well-known corporate trainer. So my dad’s a financial planner, which is a lot of education. So, that sort of teaching is in my DNA. It’s like at the molecular level for me. So I have a real passion for that. Then the second part is if somebody tells you that they really understand digital marketing, they either do not understand digital marketing or they are a liar because nobody understands it and nobody can. You can understand little pieces of it. That’s why I surround myself with incredibly smart folks at Convince & Convert because I don’t know everything and I don’t try to. There is no job like this job, where every single day is different and every single day. I don’t mean, I’m not just saying “every single day,” I mean every single day you have to continue to aggressively get smarter because you have to stay ahead of your own clients. I personally read or at least skim 20 to 30 email newsletters and blogs a day still, every day and I have for 25 years, right? You have to continue to sharpen the axe in a way that you simply don’t in a lot of other businesses. Yes, continuing education is important in all professional services companies, but for what we do, what we recommended to clients 30 days ago or three months ago is totally different than what we’re recommending to clients today. That is exhilarating and it’s also really hard. Kate: Do you have one like favorite client that you work with you were able to help that you got great results and you like you share? Jay: Man, that’s a good question. I don’t know from a results standpoint, necessarily. We try and produce results every time. I think we do or we wouldn’t be in business. One that I was just really honored to work on that we do some stuff with is for the United Nations. The division of the United Nations that we’ve worked with is called FAO, the Food and Agriculture Organization. They’re based in Rome. And I got a chance to go out there to Rome and do a speech to a lot of different delegates in the United Nations and talk about how to help solve global hunger with social media, which is a pretty exciting and challenging topic to take on and do a speech about. Their role, their mission statement is to eradicate hunger. It’s just so humbling to work on a project like that and with people like that who not only are incredible professionals. So smart and really fantastic, but just a higher calling in the true sense of that word. So, that’s probably one of the clients that we have worked with that I’m the most proud of. Kate: That’s awesome and so true. I think about that all the time when you see those bigger purpose-type things. You’re like, “Oh, really? I’m in marketing.” Not saving the world. Kate: Come on, Jay. Step up to the plate. You don’t do enough. Jay: My background is in politics. I was originally a political consultant. That’s what I did. I ran political campaigns. Kate: You’ve had your hands in all different areas. Jay: No doubt. People ask me, “Don’t you want to run for office?” I’m like, “No.” I know way too much about how that actually works. Kate: Yeah. No. I would never be either, ugh. But good for those people who do. We need them. Jay: Hey, but if people are going to get elected with social media now, maybe I’ve got a chance. Jay: I don’t have Trump Twitter followers, but I’ve got a lot. Maybe. We’re going to make the internet great again. I need a hat. I need a red hat. Somebody send me a hat. Jay: That’s true. It’s funny you mention that because we had an idea. It didn’t materialize but with my PR firm, we had this idea that we were going to just send boxes and boxes of copies of my book, “Hug Your Haters,” to Trump rallies and just hand them out as just like a viral media stunt. It ended up not materializing for a bunch of reasons. Yeah. Kate: That is awesome. You know what I think is so interesting, just speaking about politics and just different people online, the way that people communicate online where you feel like you know someone just because you’re tweeting them or you get to see the great work they’re doing and we all just kind of get to be cheerleaders of each other before you’ve even met them. Then if you go somewhere and meet them in person, you’re in awe of them standing there. Kate: Yeah. That is true. Obviously people need to be looking ahead and not really taking this day by day. How can companies get better at doing that, strategically thinking about what they should be working on now, to be able to have a recognizable brand, even if it’s in their little niche? What I always tell them is, “No. What you need to do is every 90 days, you have to make those channels audition for your own attention. Make them audition for budget. Make them audition for time.” Say look, the default state isn’t doing everything. The default state should be doing nothing. You have to prove a rationale for every single thing you do. If you do that, it forces you to think about outcomes. It forces you to think about long term. The other thing that really helps in that regard, Kate, is to spend as much time with customers as possible. It’s one of the great disappointments in my marketing career. I’ve been in marketing now for almost 30 years and one of the things that’s changed a lot because of technology is we just don’t talk to customers the way we used to. I really believe that to be true. We have gotten away from that. We’re like, “We can learn all we need to learn if we just press this button and read this report.” Nothing substitutes for actual interactions and conversations with real people and real clients. So, the companies that do that, that are really aware, hyper-aware of what their customers actually need, and how their customers use technology, are the ones that are going to succeed long-term. Kate: I love that. That alone is awesome tip for everybody out there. And one of the things that I really appreciate about your content and what you do with your books is you give such great examples of how companies do that to help other companies see how they can just engage with their clients and customers a little bit more. Bonus round. But before I do, do you want to kind of share any other tips or little recap of today’s session? Jay: I would say that of all the companies that we’ve worked with and there are lots of them, the ones that are the most successful, the ones that are the best projects for us, and the ones where I think the outcomes are the best, are the ones that have the same attitude we have, which is we don’t know everything and we’re totally okay with that. When it becomes a contest between the company and its consultants on who’s smarter and who knows more and all that, then it’s typically a very counterproductive engagement. So, we love people who have the courage to say “We don’t know everything, but we know how to find out.” Because that’s how we approach the world and I think it’s a very healthy attitude, especially in digital, where you don’t know everything. You may pretend to, but you really don’t. That’s one of the things I don’t like about right now in sort of the digital environment, there are a lot of people whose personal brand is based on the thesis that they have some sort of secret sauce and there is no such thing as secret sauce. There’s first-mover advantage. But being first doesn’t make you smarter. It just means that you’re first. I hope we can wring that out of the industry at some point. Kate: Awesome. Okay. Are you ready for your bonus round question? Kate: Okay. What is your marketing superpower? Jay: I think I’m a pretty good writer, but that’s not really a superpower. I would say my actual superpower, I’m going to give you two. One is pattern recognition. So, I can see patterns before most people can see patterns and I pick up on them and I can identify them and talk about them. “Youtility” is a good example. The concept of utility and useful marketing and turning that into a marketing thesis, I saw that coming before a lot of people saw it coming. But I would say my best superpower is I can identify talent. I tend to hire and surround myself with extraordinary people, which is why we’re doing this Talk Digital to Me series and not just at Convince & Convert but in all the companies that I’ve run, this is the fifth marketing services company that I’ve started and I have hired, I don’t even know, probably 250 people, 200 people, I don’t know, a lot of people, all of whom are marketers. Of that batch, two didn’t work out. Jay: And among the people that have worked with me as young professionals, something like, I haven’t run the numbers recently, but it’s something like 15 or 16 of those people have gone on to start their own companies. So I have, I don’t even know how, it’s not like I have some amazing interview process or whatever. I’ve just got a really good sort of natural knack for within 20 minutes, being able to identify, this person has the magic or doesn’t. So, that’s served me very, very well because you’re not having to replace people all the time. Kate: Oh my gosh, yes. Most business owners envy that, I’m sure because that is a process-and-a-half to hire people, especially the right people. So, number two, what digital marketing trend are you most excited about? Jay: I really am excited about bots, the Facebook messenger bots, SDK, WhatsApp–this whole opportunity to use chat bots for marketing and for customer service. There are going to be some missteps there. There’s going to be some spam. There’s going to be some craziness. But it reminds me of when email first came out for business, which is going back a while. That’s like when I first got started in the early ’90s. It is going to change everything. I’m telling you, folks, if you’re not really focused on bots and the opportunity for your business, get on it because it’s going to happen way faster than you think and it’s going to be way more transformative than you think. I’m really excited and fascinated about where that’s going to go. Kate: Cool. If you could only have one mobile app for the rest of your life, what would it be? Jay: Well, I don’t know about the rest of my life, maybe like a funeral planning app would be a good idea. Is there one of those? I’m sure there is. But I would say, given what I do now, which I probably won’t do forever, but based on my current life and for the foreseeable future, probably the app that is the most indispensable for me is TripIt, which is where it stores all of my travel plans. So here’s when the flight leaves, here’s where the hotel is, here’s what time sound check is. It organizes all my travel and where I’m supposed to be at all times. Literally without that, I don’t even know how people used to do that. I kind of do know because I used to travel pre-smartphone, but we used to print out a ream of papers and you’d staple it together. You’d carry your batch of papers with you and when you got to one destination, you’d rip that one off and throw it away. It was ridiculous, right? So being able to have all my travel stuff in one app in TripIt is probably the most indispensable to me. Kate: Awesome. Yeah. Not everyone is on the road 200+ days out of the year. Jay: True. That is true. 280, actually is what it will be this year, which is plenty. Kate: Awesome. Well, Jay, thank you so much and thanks to everyone for joining us on this episode of Talk Digital to Me. Jay: Talk Digital to Me. Kate: I know. I feel like I want to dance every time I say that. Jay: Yeah. Let’s commission some sort of sound effect for the end of the show. Kate: Oh please do. Yes. We need some little sound effect, something we can dance to, something fun. Jay: Who’s the next guest on the show? Kate: Jess. Jess is the next guest on the show. Jay: The mighty Jess Ostroff, who is our managing editor and executive producer of Convince & Convert Media. She is also the president of Don’t Panic Management. Some of you may know her brand. Jess is one of those people who started with me a long time ago, as an intern, and now has her own very successful business. So I couldn’t be more proud of her. Kate: You guys went to college together, right? Jay: We didn’t go to college together, but she interned for me when she was in college. I’m old enough to be her dad almost, so we didn’t go to college together. Pretty damn close, so yeah. Kate: You have a youthful glow, though, Jay. Jay: I do. You know why? I’m always indoors. I’m an avid indoors-man, which keeps you youthful, I think. I have very soft hands from lack of physical labor. The tips of my fingers are calloused from the keyboard, but that’s it. It’s not like I’m swinging an axe anytime soon. I have a guy for that. I have an axe guy. Kate: You’ve got a guy. Everyone needs a guy. Jay: I have a whole Rolodex of guys. Rolodex, there’s a nice reference. There’s a nice 1975 reference for you. Jay: Thanks everybody for tuning in to Talk Digital to Me. Tune in next time for Jess.